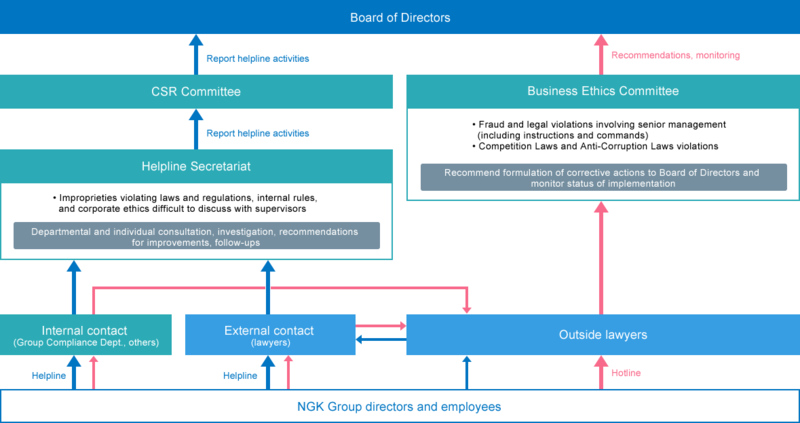 We have established a helpline to receive inquiries and reports from employees aimed at curtailing and preventing activities contrary to the spirit of the NGK Group Guidelines for Corporate Behavior and to facilitate the quick resolution when issues occur. Each overseas Group company has its own helpline. Those seeking advice or reporting issues are promised protection under corporate regulations. There were 43 consultation cases in fiscal 2017. We have established a hotline as an internal control system for responding to fraud and legal infractions committed by senior management, including Competition Laws and Anti-Corruption Laws violations. The hotline is operated by outside lawyers, with issues handled by the Business Ethics Committee, composed mainly of outside directors, who report directly to the Board of Directors. We have been pushing forward with the establishment of the hotline at overseas Group companies in light of the circumstances in each country. 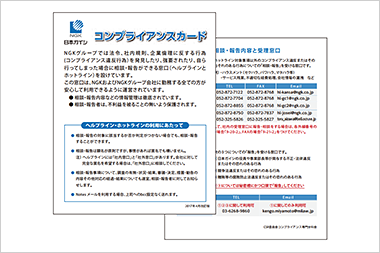 For thorough awareness of the whistle-blowing system, we created a carry-size Compliance Card and distributed it to all employees at NGK and all domestic Group companies.